Last week, Stack’s Bowers Galleries conducted the Official Auction of the Whitman Coin & Collectibles Baltimore Expo, an incredibly successful sale that realized $11,922,392. Offering U.S. coins, paper money, medals and tokens, the sale featured a number of significant collections. Colonial coins paved the way, with Part III of the Legendary Ted L. Craige Collection leading off Session One of this impressive sale. Other notable collections featured included the Janet Nakushian Collection of Silver Dollars, the Dr. Hans and Birgit Neuberg Collection, the Bob and Sarah Ross Portfolio, Shell Cards from the Stephen L. Tanenbaum Estate, Part II, an Important Collection of Rhode Island Obsolete Proof Notes, and an Advanced Collection of Fancy Serial Number Notes, just to name a few. Part III of the Ted L. Craige Collection presented more than 400 lots of colonial issues and provided a number of significant results. The session began with a wonderful example of the landmark Libertas Americana medal in silver graded MS-62 by PCGS that sold for $99,875, and was immediately followed by the Choice AU Lord Baltimore groat, a beautiful, ex: Boyd coin that saw hefty bidding and finally reached a substantial $70,500. One of the most significant pieces from the Ted L. Craige Collection was the extraordinary New Yorke in America token, a very rare early token which, when seen at all, is generally seen in poor condition. This example, however, is wonderfully sharp with superb eye appeal and, graded EF-40 by PCGS, sold for a very strong $94,000. On the evening of March 14, Stack’s Bowers Galleries held The Rarities Night Session, which contained 200 lots of top notch rarities. 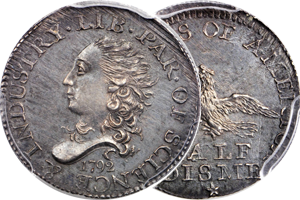 Notable realizations here included the beautiful 1792 half disme offered as lot 2025. Graded MS-64 by PCGS, this example of the historic issue sold for $470,000 when it crossed the block. Gold issues boasted their fair share of rarities as well, with the 1892 quarter eagle in Proof-68 Deep Cameo (PCGS) that sold for $111,625, the 1907 Wire Rim Indian eagle graded MS-66 by NGC and verified by CAC that went for $111,625, and the 1912 double eagle in Proof-66 (PCGS) CAC that topped out at $117,500. Session Six featured U.S. currency, and boasted the largest banknote sale that Stack’s Bowers Galleries has held in Baltimore. After more than eight hours and 835 lots, the session clocked in at just over $2 million. Obsolete currency saw active bidding, exemplified by lot 5183, an exceedingly rare Bank of North America $1000 color proof that brought $29,375. Federal issues included a modest offering of Large Size notes followed by a spectacular section of Small Size notes, anchored by the Thomas Vandenbosch Collection. For a complete list of prices realized in the Stack’s Bowers Galleries March 2013 Baltimore Sale, visit stacksbowers.com or call at 800.458.4646. Stack’s Bowers Galleries is currently accepting consignments for the June 2013 Whitman Coin & Collectibles Baltimore Expo.